Up to 40% of a building’s energy is lost because of air infiltration. Air flows through gaps, cracks, and holes in through an HVAC systems, meaning more energy is used to maintain the comfort level of the building. Spray foam insulation outperforms other types of insulation because it can expand and tightly fill those crevices that might otherwise have been left exposed. Its resistance value — the ability to create an airtight seal — is R-6, the highest ranking on the market. Spray foam insulation can be very effective in sealing roofs and other areas where condensation accumulates the most, as too much moisture can lead to mold and weaken the structural integrity of buildings. Because the insulation creates a powerful bond to the roof, it can strengthen its resistance to wind and pressurization. Spray foam is also useful for reducing sound, providing a barrier against road traffic, and other loud noises. Homes and commercial buildings that are insulated with spray foam have better protection against mildew and mold. The polymer within the insulation is inert, meaning that it provides no food source for mold or bacteria. It also provides a barrier from external moisture, further preventing mold from growing. Since walls are a building’s main structural component, they need to be able to withstand a certain amount of force — like shaking during high winds. When spray foam insulation is inside of the walls, it provides additional strength so the building is supported more efficiently. Because spray foam insulation expands, it’s uniquely able to fill up all of the cracks and holes in attics and crawlspaces. In particularly cold or hot weather, air coming through small cracks and holes throughout a house is the primary cause of energy loss. Spray foam insulation can create an airtight seal that’s 24 times less permeable to air infiltration. It can also provide a moisture barrier, keeping water from seeping through cracks, holes and crevices and damaging walls and floors. When homes and commercial buildings are insulated with spray foam, owners can save a significant amount on energy costs, usually an average of 50% or more, along with other benefits such as mold reduction and increased structural integrity. To find out how you can cut your utility bills up to 48% with easy and cost-effective solutions, please see our brochure on Insulation. For more information on spray foam insulation, contact USI online to find a branch near you and get a free quote. USI believes that excellence in every step of the process and ensures timely completion and quality of service, time after time. 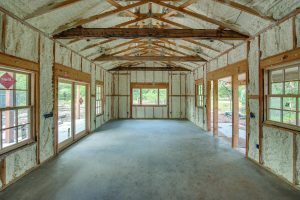 What’s the Difference Between Spray Foam and Batt Insulation? They were extremely pleasant, careful and worked quickly. Pleasure to have them work here. You won’t ever regret using this company. We have used others that used shortcuts to save them money, and it’s just not worth it. Spend the money and know you are getting the best. They did good work and gave us a good price. They had the best price of anyone we got estimates from.